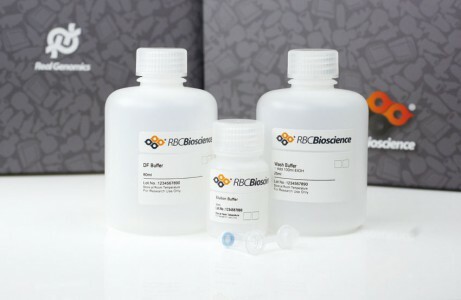 The RNA Extraction Kit is specially designed for rapid purification of total RNA from animal and plant tissues, bacterial, cultured cells and whole blood. The Total RNA Extraction Kit (Blood/Bacterial/Cultured Cells) is specially designed for purification of total RNA from bacterial, cultured cells and fresh human whole blood. The method uses detergents and a chaotropic salt to lyse the cells and inactivate RNase. 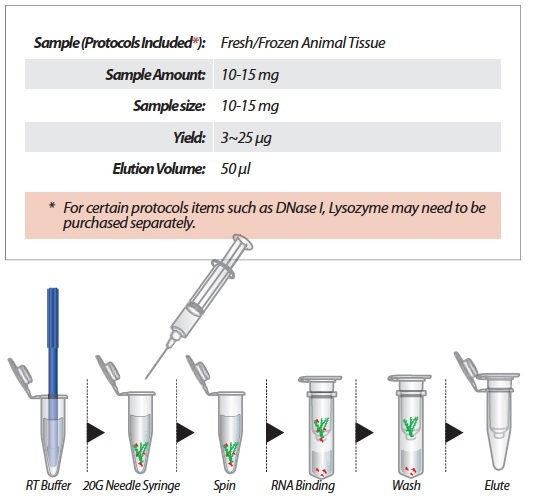 The lysate is applied to provided Lysate Filter columns (Mini System) to remove cell debris and ensure complete cell lysis. RNA in chaotropic salt solutions binds to the glass fiber matrix of the columns. Following washing off of contaminants, the purified RNA is eluted by RNase-free water. ssRNA and dsRNA of > 200 bps to 1000′s of bps in length are efficiently purified. 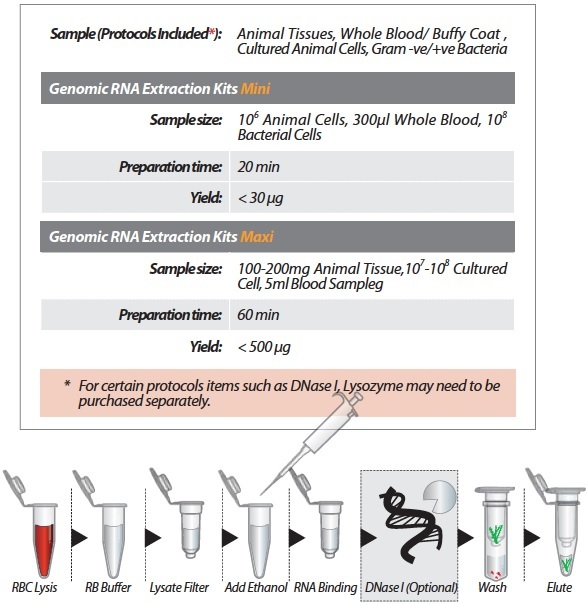 The Total RNA Extraction Kit (Tissue) is specially designed for purification of total RNA from a variety of animal tissues or cells. The provided micropestle (Mini Format) efficiently homogenizes tissue samples in a microcentrifuge tube. The method uses detergents and a chaotropic salt to lyse cell and inactivate RNase. RNA in the chaotropic salt solution is bound to the glass fiber matrix of the column. Following washing off of the contaminants the purified RNA is eluted by RNase-free water. The entire procedure can be completed in 20-40 minutes. ssRNA and dsRNA of > 200 bps to 1000′s of bps in length are efficiently purified. 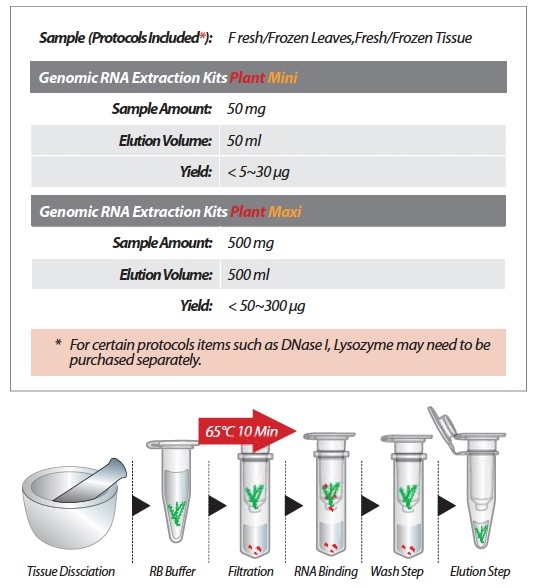 The Total RNA Extraction Kit (Plant) is specially designed for purification of total RNA from a variety of plant tissues. The method uses detergents and a chaotropic salt to lyse cell and inactivate RNase. RNA in the chaotropic salt solution is bound to the glass fiber matrix of the column. Following washing off of the contaminants the purified RNA is eluted by RNase-free water. The entire procedure can be completed in 40 minutes. 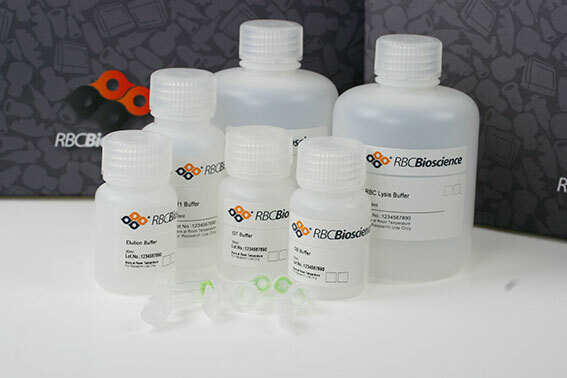 ssRNA and dsRNA of > 200 bps to 1000′s of bps in length are efficiently purified.